← Come Monday, it’ll be all right. Do things really happen for a reason? Sometimes. But, sometimes, falling short is just a part of the human experience. It is never easy when we miss the mark. Or, comforting your son or daughter when their team loses a championship game. Or, in our case, when I beat John Henry in Uno, and he looks at me like I’ve just destroyed his day. There are occasions where he wins, but I generally play him straight up. Sound harsh? Okay, it’s only harsh when I chant to the tune of a Queen favorite, “I am the champion, my friend.” And, I don’t do that every time. Back to the topic at hand. Fact is, if you haven’t fallen short yet, chances are you will. It’s a part of life. The key is to give it all you’ve got. And, we learn more from our failures than we do our successes. We all know that. They are not nearly as fun, but they build character – the good kind. 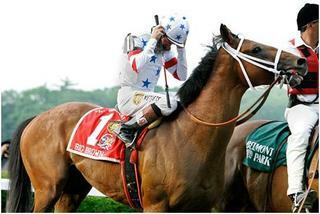 And, although Big Brown didn’t take the Triple Crown, he did win two others. So, even if he never runs again, he will have finished well. Well said, Dusty, I agree, like Pastor Mike says, “a spirit of Excellence”! It is hard not to succeed all the time, fear of failure could come in, but if we know, we need to try again, again, and again, then we won’t give up! We will press on, get up again. Great blog Dusty! Keep up the good work! When we fall short, our character develops. I think failure, at some times in our lives, is very appropriate. Dusty, while I understand what you are saying I think the word “failure” is a little over used. Failure leaves the impression that whatever you were trying to accomplish was completely lost. Falling short is probably the better verbage. It is really not the “failure” that builds character. It is our response to the “failure”. Character is built when we succeed by trying again with a different path. I prefer to think that I just discovered another way not to do something; then I just need to find a different way to reach my goal. Many wealthy people became very poor trying different things before finding what works. Spiritually speaking, how can we fail (even with our human frailties) when we have such a great Intercessor. We do fall short, but we are already forgiven. Ask, seek, knock. Keep up the blogging. You know I appreciate you. I agree completely. I think we are on the same page. It’s all semantics at this point, and failure vs. falling short. The heart of it is the same. WELL let me tell you I felt that the jockey was the biggest winner in that race as anyone or any horse. For someone who has had horses and a HUGE horse fan, as well as having part of my family own a horse that WON the Kentucky derby I know that they can push a horse till death to win a race. NOW, with that being said they take EXCELLENT care for there horses but PUSH PUSH PUSH on the field… That jockey knew something was wrong with his horse and it could have been a number of things at the moment but he didn’t want to kill him or make him lame.. SO with all of that being said I do have a point.. My point being, we all get too hot and get sick from it, some pass out some don’t but we all need to realize what we need in the moment to make us a better person. Hey slow down and drink some Gatoraide, or jump in the pool. But life is hot and cold and can be perfect but SIEZE the day and the Moment.. We all are winners just not all of the time….